A sealed move is the last move played on the first day of multi-day title matches, such as the Japanese Kisei title match. Once a particular time of day has been reached, either player has the option of sealing his move, which he does by notating it on the game record which is then sealed in an envelope. When the game is resumed the following day, the previous day's moves are replayed, the referee opens the envelope and reads out the sealed move which is then played on the board. The sealed move system is designed to alleviate the disadvantage to the player who has to play the last move of the day. Without it, his opponent would have the entire evening and night to think about his answer. Of course, it is to the advantage of the player who plays the sealed move to make a move which requires a particular answer by his opponent, because he then can use the evening to think about the best move following the forced answer. No pro, however, would play a move whose only purpose is to force an answer, because that would both be considered both bad form and could also potentially entail some loss (in the extreme case, for instance, of a ko threat-like move). The player will attempt to find a move which is both natural in the context of the game and has a strongly preferred answer. In the Go world, sealed move was first introduced in Shusai's 1938 retirement game against Kitani Minoru. See Kawabatas Master Of Go for an instance where this caused some controversy. tb: The 1971 Honinbo Tournament book treats the sealed move as if it were just expected to be a kikashi. Bill: Traditionally, go games were often adjourned, at the discretion of the White player. Nobody ever admitted it publicly, but White often used the adjournment to his advantage. Shusai Meijin Honinbo is said to have played a move against Go Seigen which was suggested during an adjournment by his pupil, Maeda Nobuaki. Bill: Japanese pros have been of two minds about the advantage of the sealed move. Even though it is part of the game, exploiting the sealed move has a sense of unfairness to it. One lesser pro wrote about making the sealed move in a two-day game against Takagawa. That evening he felt like calling Takagawa up to tell him what the sealed move was. 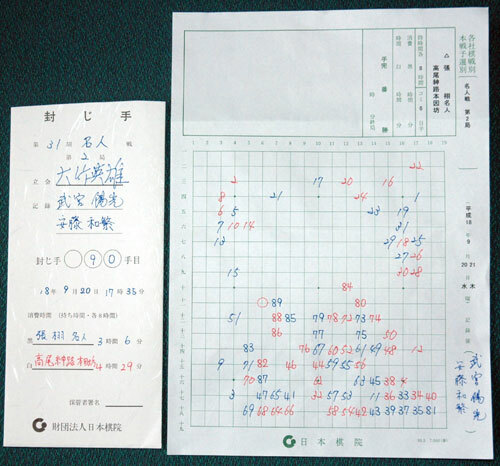 An example: the game record sealed at the 90th move in the second game of the 31st Meijin Title match between Cho U and Takao Shinji. The sealed move is marked on the game record with an empty red circle. Were it Black's move, the marking would be an empty black circle. This game is mentioned in Pieter Mioch's interview of Go Seigen at www.gobase.org, and the game record is available at http://jeudego.org/parties/parjou/jou_041.htm (but which move was the sealed move? ).